Brebis closed in July 2016. The owners are starting a new project, Nomadic Restaurant, and in time the restaurant will be taken over by a new owner, chef and team. I’ve left this review up for posterity. Let’s cut to the chase: Brebis is really, really good and you should go there. It’s nice to have that out of the way. On with the review! Brebis appeared on my radar a little while ago, though I can’t quite remember how. When I checked out the website, it looked like the real deal – a little unfussy French restaurant that just happened to be slap bang in the middle of Newbury. 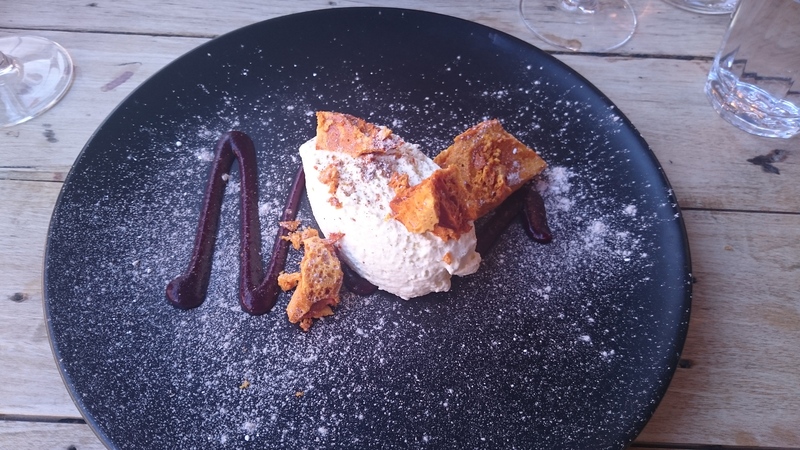 Now, I haven’t been to Newbury before on duty but after last week’s lukewarm review of a town centre bistro I decided to go double or quits and troll out to West Berkshire, an area I’ve previously rather neglected on the blog. In my defence it’s been a long time since I’ve been to Newbury (years, I’d say) and I didn’t have fond memories of it; I remembered it, unfairly I’m sure, as a lacklustre market town with little to offer that Reading didn’t have. Well, I was plain wrong (and you can take that to the bank). I had a lovely excursion there of a weekend – it has a decent market (I very much enjoyed the fresh bread I bought), an irascible butcher (sausages for my dinner the following night) and a truly magnificent wine and beer shop that had a selection of gin (Japanese? Colombian? Welsh?) that knocked my socks off. I returned with groaning bags. But, more to the point, it also has an outstanding French restaurant that dished up one of the best meals I’ve had this year. Brebis is in a pedestrianised bit of Newbury – it’s in an old house but, regrettably, with an unlovely view of the side of the Kennet Centre (think Broad Street Mall, not Oracle). Not terribly scenic but no matter, as the inside is a different affair. The walls are white with the occasional blackboard, the floor is stripped back to boards, the lampshades are all industrial without being faddy and the generously sized tables are smart rustic, with comfy chairs and really good quality linen napkins. Even the cutlery was reminiscent of Parisian restaurants I have known and loved (and there have been a few). So far so chic. The greeting at the door was incredibly welcoming. We got in without a reservation and were shown to a table in the window and given a brief explanation of the menu (all on chalkboards, because Brebis is trialling the restaurant equivalent of the paperless office). This involved a good nosey around and some really tricky choices. During the day Brebis offers a prix fixe menu, offering a choice of two courses for just under twenty pounds or three for twenty-three. Only a couple of options for each course, and nothing I could see for vegetarians, but there was also a much bigger a la carte menu which repeated some of the prix fixe options. Starters on the a la carte were about eight pounds and mains around eighteen, and a suggested wine pairing was listed with every course, something I didn’t fully appreciate until later. Fortunately for us, all of the dishes we fancied from the a la carte were also on the prix fixe, so I felt especially pleased as we made our choices, sipped our wine and looked out the window at the passers by (enjoying the “I’m inside having a lovely lunch and you’re not” feeling). They even played Edith Piaf on the Bose sound dock by the door. Really, it was almost too perfect. 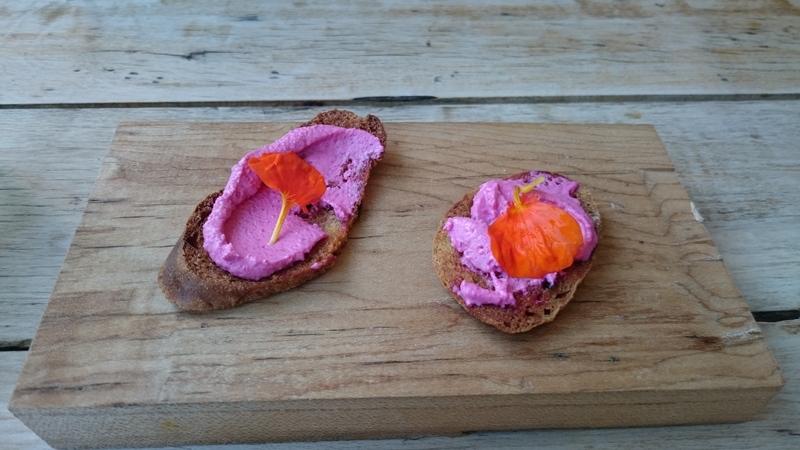 And before we even got to the starters there was an amuse bouche of beetroot crème fraîche on a wafer thin crouton, with a nasturtium petal on top. It was as tasty as it was pretty, the slightly sweet crouton combining beautifully with the crème fraîche. I’m never sure about edible flowers – they make me feel a bit like Ermintrude from The Magic Roundabout – but they definitely didn’t detract. The first real glimmers of greatness came with the arrival of the starters, because it was around then that I started to think that everything was going to be quite a lot more than all right. Duck liver and foie gras parfait came with a decent wodge of home made baguette and courgette chutney. Goodness, it was marvellous stuff: rich, smooth and earthy, cool enough to keep its shape but easily spread on the gorgeous bread. And the bread! Crusty and chewy but with that spongey middle, a texture that the French take for granted in their Government-regulated ninety-five cent loaves but which you can’t find here for love nor money. The courgette chutney was spiced with a slight hint of curry which made it seem almost mango-flavoured, and although I liked it, it felt a bit unnecessary. 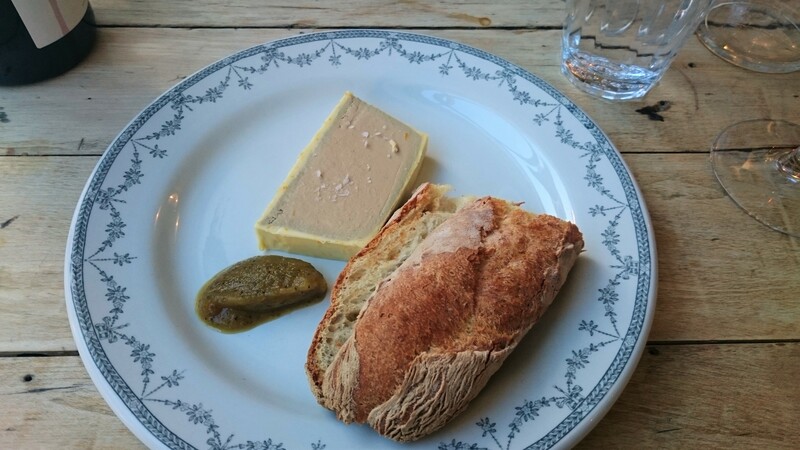 But that’s by the by: I order foie gras and chicken liver parfait quite often, and I nearly didn’t order it here because I wondered if it would be a good test of the kitchen, but this was one of my starters of the year. Even the little touches – a few little flakes of salt on top of the parfait – were right on the money. The other starter was also top-notch: a hefty helping of jambon de bayonne with a pile of celeriac remoulade in the middle. 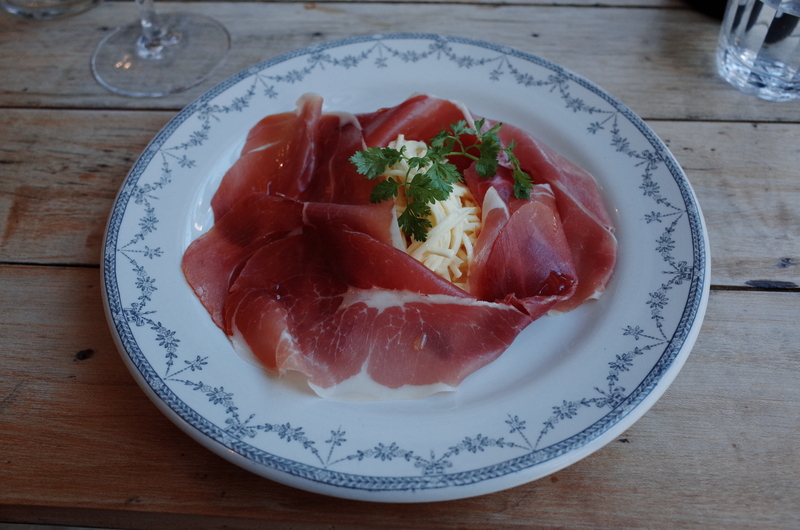 Really, the ingredients did all the work: the ham was terrific, every bit as savoury, coarse-textured and intense as its Italian or Spanish cousins. The celeriac remoulade, everyone’s favourite upmarket coleslaw, was an elegant balance of creamy and crunchy. And one final touch – the tiniest dabs of truffle oil, glistening on the ham. I’ve never had this with charcuterie before, and I’d normally be sceptical, but used sparingly it topped the dish off without overpowering it. A simple, perfect classic. When the mains arrived I wasn’t sure which of us had picked better. 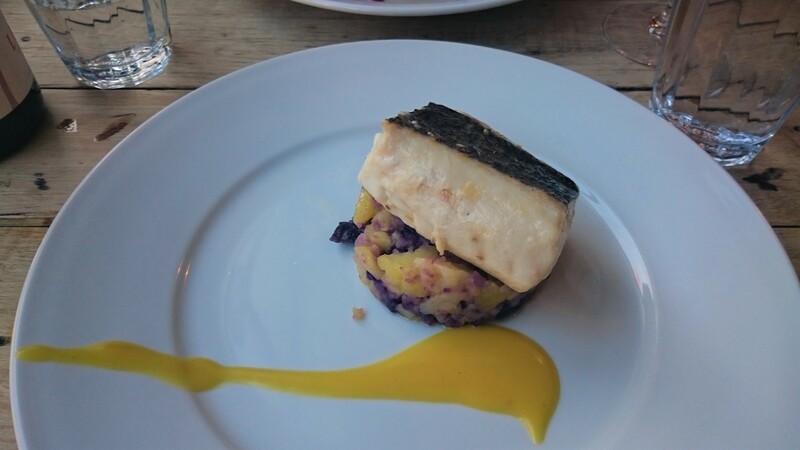 I’m running out of superlatives already, but butter poached hake with purple potatoes and roast lemon purée was flawless. The chunky piece of hake was cooked through but beautifully moist from being poached (I daren’t think what butter poaching entails, although I have a vague idea: fortunately all meals I eat when reviewing are calorie free). Under that was a disc of crushed potatoes, some purple and some white, all very buttery and just the right texture – yielding but not super soft. On the side was a smear of lemon purée, rich and creamy with a hint of sharpness which was simply beautiful with the fish. I can’t remember when I have eaten something so delicate and harmonious this year, let alone on a set menu. Sometimes on a set menu you can get quite prosaic dishes, but this both looked and tasted dazzling, colour and flavour completely in step. The other main was definitely more the stuff of a prix fixe. Confit duck is beginning to get a bit done to death (partly, I suspect, because pubs and restaurants appreciate that it’s quite an easy thing to churn out) but by this stage I was more relaxed because I had a feeling Brebis might do a definitive version. And they pretty much did. 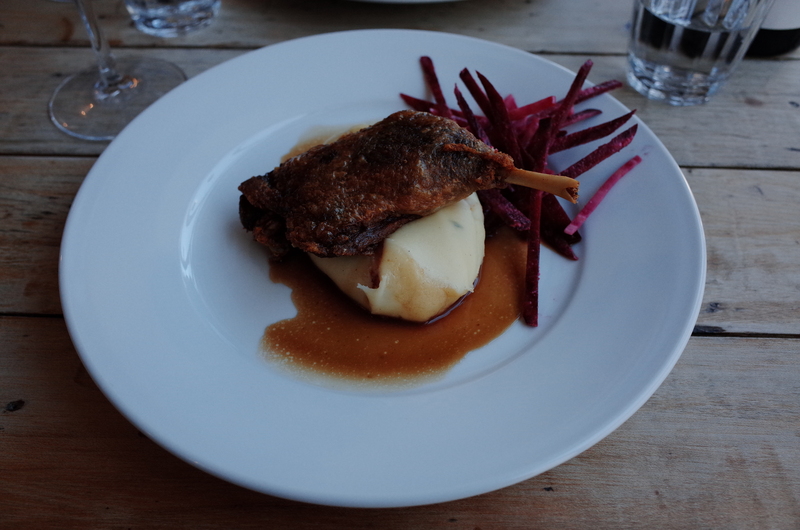 The duck was just magnificent – lots of tender meat underneath, parted from the bone with no effort at all, but more importantly on top the crispy, salty skin breaking into delicious shards. The pomme purée it was served on was a fantastic mash, firm rather than gloopy, with thyme and little strands of bacon running through it. The jus was tasty, although I’d personally have liked a little more of it. Finally the only misfire possibly of the whole meal – some distinctly odd batons of beetroot which, for me, just didn’t go. Personally, I’d rather have had something hot and cooked rather than cold and crunchy, though of course, I still ate it. The set menu has a fantastic wine offer – a half litre carafe for the bargain price of nine quid – but instead we went for a bottle of Lirac, a soft, fairly light Rhone Valley red that was a bit of a compromise solution given the two main courses. Even so it was cracking, eminently drinkable and decent value at just over thirty pounds. The wine list at Brebis is all French and everything except the very top end is available by the glass (with the cheapest 125ml wine by the glass at around three quid). I didn’t realise that, or that the way glasses are priced means that it’s just as economical to drink glasses as it is to order a bottle. Still, it’s a lesson learned for next time and there are worse things in life than having a gorgeous red with lunch. After two excellent courses it would have been a crime not to have dessert. But then we couldn’t decide between the cheeseboard (yes, another cheeseboard) and the dessert menu. So in the end we had a cheeseboard to share followed by dessert. Yes, I know: this is bad and wrong and I certainly wouldn’t expect you to behave so terribly, but I rarely get to eat this well on duty so I went for it. 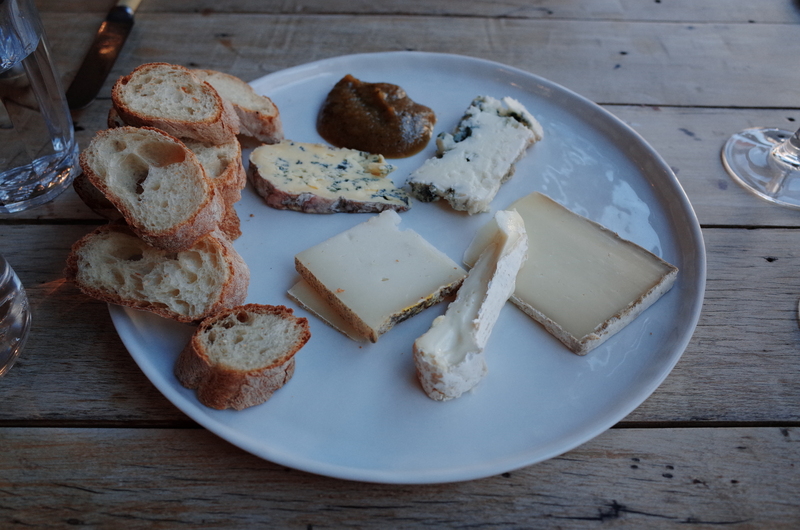 The holy trinity of local cheeses – Wigmore, Spenwood and Barkham Blue – were all present and correct, along with Woolsery (a Dorset hard goat’s cheese) and, because Brebis is French, after all, some Roquefort. Again, simplicity was key – no overcomplicating apple, celery or walnuts, just good cheeses, a pyramid of slices of the beautiful baguette from before, more courgette chutney and some room temperature butter. I scored it, I’m afraid, as France 1, Berkshire 0: Barkham Blue is one of my favourite cheeses but I think on this occasion the Roquefort just had the edge, being riper, softer and saltier. The cheeses were served cool but not chilled and the Wigmore was ripe enough to making a break for it across the plate. It all went terribly well with a glass of Muscat de Rivesaltes – red, unusually, rather than white, lightly chilled, with a beautiful raisiny flavour, a great foil for the saltier cheeses. All that for eight pounds fifty: miles better, and miles better value, than any other cheeseboard I’ve had this year. The desserts are, thankfully, quite small and chilled (I think a sticky toffee pudding or anything with custard would have killed me at this stage). Green apple bavarois (I had to Google it before ordering, to my shame and even then it wasn’t quite what I was expecting) was a lot easier to eat than it was to pronounce: it was a big quenelle of something halfway between a fool and a mousse. The apple was quite a light, refreshing flavour, which saved it from heaviness. Big chunks of honeycomb added some texture and there was a zigzag of blackberry gel underneath (which wasn’t really needed, if I’m honest, but it did look nice). Delicious, simple, clever: bit of a theme emerging, isn’t there? 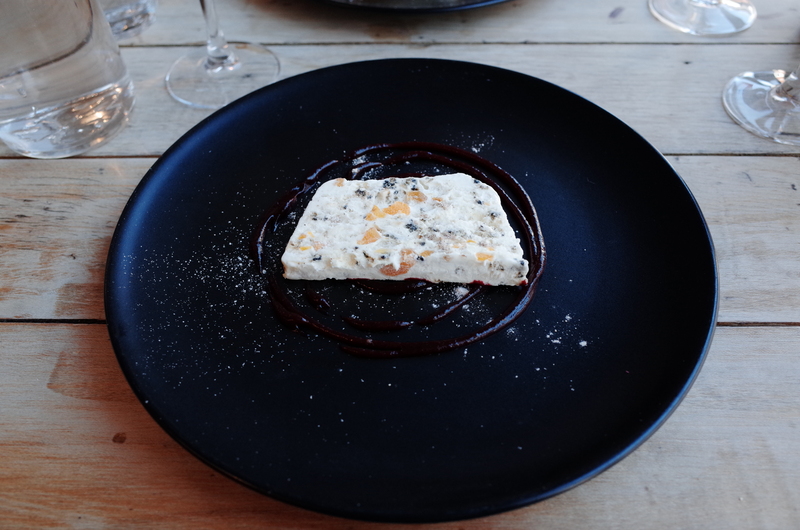 Iced nougat parfait was a lovely way to finish. A small slice of the parfait, with a honeyed taste to it, studded through with fruit and nuts – cold, fresh and clean but with just the right sweetness and texture. Again, there was lots of the blackberry gel on this one – and it was beautifully plated, such a simple, pretty dish – but it felt like it was more of a match with than with the bavarois. In truth it meant the two desserts we ordered were pretty similar and, in honesty, the bavarois was probably a better choice. But the worst of the two desserts here was still better than most desserts I’ve eaten this year, and it cost just over five pounds. We managed to squeeze in a glass of sticky, fragrant Cadillac with the dessert; by this point it seemed pointless to deny anything, being slightly squiffy with happiness. Service was a one man job, namely one man doing a brilliant job. He was charming, chatty and enthusiastic throughout, knew his way round the dishes and the wines, brimmed with passion and was delighted to get good feedback. He was just as charming at the other tables and showed a real interest in his customer (some of our fellow diners were celebrating their anniversary: one of them definitely deserves some brownie points for the choice of venue). There was no superfluous topping up of wine glasses – a real bugbear of mine at the high end – everything was laid back and unfussily spectacular. Our total bill, for three courses each, a cheeseboard to share, a bottle of wine and two glasses of dessert wine each (it sounds even worse when I put it like that) was just short of one hundred and twenty pounds, not including service. You could, in fairness, spend a lot less: if you didn’t get as carried away as I did, came here on the prix fixe and shared the set wine you could have a meal for two for about half that price. But I have no regrets: this has been one of my meals of the year, and it justifies all those times in 2015 when I’ve drizzled away money on mediocre food, underwhelming wine, indifferent service. Also, did I mention the Edith Piaf? Normally I don’t talk about the ratings in my reviews, but this time I have to make an exception because, as you’ve probably already seen, this one breaks new ground. When I look at all the places I’ve given good ratings to over the last two years, fantastic though they are there’s always been something missing. The furniture’s a little uncomfortable, the wine selection is a bit uninspiring, the service just a tad too rushed. Or there’s one course that drops the baton, leaving me thinking If only… But Brebis literally didn’t put a foot wrong, and that puts it in another class. By the end of the starter I was wondering who I could take next time. By the end of the main course I was wondering how many visits I could feasibly make to Newbury before the end of the year. By the end of dessert I was wondering why this place wasn’t full and how they would feel about being dismantled brick by brick and forcibly relocated to Reading. Until that happens I urge you to jump on a train and go there. Take someone you either really like or really want to impress, or both. I might be at the next table; my next visit is already in the calendar. Is it worth us veggies going . The website suggests yet another rissotto . Yes it was a risotto on the menu when I visited. That said it is a risotto that name checks Clause Bosi, so it won’t be your run of the mill dish. It’s perhaps worth ringing up to see what the veggie main will be, just in case you don’t fancy it or in case they can offer something else. A 9! I am very excited for you. The dishes look amazing. Woodspeen is on my list, actually, but it is on the outer limits… Brebis is reachable by public transport, though, which helps. Read the first line of this review and decided that was enough to go immediately for lunch today. It was utterly superb, I can’t believe they’ve been open a couple of years, it felt so fresh and creative and new. This is absolutely my new favourite restaurant. Wow! Firstly thanks for the trust and secondly so glad you enjoyed it! Fabulous. It’s really not my area of expertise – probably best to phone the restaurant for this one. Just down the road from me, so after reading this, I really should make an effort an go, sounds amazing! The only problem I have is that whenever I walk past it always seems to be closed. Not sure what their opening times are, I will have a look now!! Enter your email address to follow Edible Reading and receive notifications of new posts by email.